1993 studio album by Dinosaur Jr.
Where You Been is the fifth official studio album by Dinosaur Jr., released on February 9, 1993. The song "Start Choppin'" was their biggest hit, reaching number 3 on the Modern Rock Tracks chart in the U.S., and the Top 20 of the UK Singles Chart. This was drummer Murph's last recording with J Mascis until 2007's Beyond. This was the only Dinosaur Jr. album between 1988's Bug and 2007's Beyond to be recorded entirely with a full band. During Dinosaur Jr.'s major label years, Mascis performed most of the instruments himself on record. The album was released to very positive reviews. AllMusic's Ned Raggett called the album "occasionally moody and dark but otherwise [...] more rough fun. [...] [I]t's a puréed blast of punk, classic rock, and more. It may be business as usual, but it's good business just the same, whether it's the gentle "Not the Same," on which Mascis does his best Neil Young impersonation, or the stuttering feedback snorts and rips on "Hide," on which he borrows a bit back from disciple Kevin Shields." The tracks "Out There", "Start Choppin", "Get Me" and "Goin Home" were chosen as highlights. Michael Azerrad, writing for Rolling Stone, was similarly positive, writing that "their second major-label album [...] recall the shambling lope of Crazy Horse-era Young, as well as hints of minor Seventies icons from Blue Oyster Cult to Humble Pie. The majestic “Get Me” is “Layla” for the distressed-denim set (even the guitar squiggle at the end is pinched from Clapton’s “Let It Rain”)." He singled out the "riff-happy" songs "Start Choppin" and "I Ain't Sayin" as "excellent" (calling the latter "a two-minute gem") and praised Mascis' production choices ("he embellishes the band’s usual all-guitar palette with timpani, chimes and strings") as "a daring move in the sadly conformist world of alternative rock". "Like many of its peers," he concludes, "Dinosaur Jr is a musical cargo cult, turning the detritus of another culture into something that can be used — and maybe even worshiped. For one of the crowning glories of slacker culture, look no further." Greg Kot wrote that what made the album "compelling is Mascis' growth as a songwriter and, apparently, as a person. On previous albums, the singer's relationship with the world outside seemed about as emotionally developed as a 13-year-old's. But on "Where You Been" his wan, dissipated voice conveys a deeper commitment and yearning. [...] All the while, Mascis' army of guitars is placed in service of his breaking heart, and the sound is majestic and moving." Robert Christgau was less positive, finding that "somehow his axe and his voice sing the same tune, momentarily transmuting his self-pity into simple sadness". He singled out the first two tracks as highlights. Prefix magazine's Matthew Flander described it as "a classic record from the band, capturing just about every great ’90s song they had aside from “The Wagon” and “Feel the Pain”." He also called the album a possible "one-up" from Mascis to Sebadoh's Bubble & Scrape, writing: "if that was his goal, you can see [...] how he might have tried to beat Barlow at his own game. And maybe there was no clear winner between the two, but we sure lucked out. Stevie Chick of BBC called it a "[l]aconic, guitar-heavy masterpiece from Dinosaur Jr.’s second-wind." "There was something unabashedly classic about Where You Been’s rock," she writes, "deriving not least from Mascis’s copious guitar heroics, layering multiple tracks of scree and howl so the entire album feels like one epic, sky-scraping solo. [...] With his fondness for extended guitar-play, his country-soaked rock crunch, his cracked and sweet vocals, Where You Been identified Mascis as hewn from the same stone as Neil Young before him." The A.V. Club's Noel Murray wrote that "Dinosaur Jr. wasn’t the most unlikely band to make the jump to a major label in the ’90s (the post-Nirvana era was a weird time), but few could’ve guessed that Mascis’ group would actually sell a respectable amount of records, without substantially altering its style. [...] Barlow-less Dinosaur Jr. came off a little less indie and a little more bombastic; yet the songs were still offbeat, personal, and far from radio-friendly." He wrote that the song "I Ain't Sayin", with "its canyon-filling bookending riff to its appealing shuffle and its heartwarming “rolling home to you” chorus [...] is a crowd-pleaser that could’ve been Dinosaur Jr.’s biggest hit if it’d been pushed a little harder—or at all." Cam Lindsay of Exclaim! called it a "slower, slightly superior (in comparison to its predecessor) grunge-era classic." She called both the releases "cornerstones" to the aforementioned movement, writing however that "unless you're jonesin' for reliving that period again, it's fair to say in today's world they're not much else." "In addition to succeeding in its bid to pluck up some post-‘Lithium' plaid-clad grunge fans," writes Josh Gray of Clash "'Where You Been? 's textbook construction of over-driven ear-worms would go on to strike chords with many later alt-90s guitar heroes. 'Goin' Home's gentle world-weariness sounds for all the world like it could be an Eels rip-off if it weren’t for the fact that E was still just a bespectacled teenager who was into birds at this point. Similarly the verbal spaghetti spilling over 'Hide' pre-dates Jeff Magnum's [sic] similar drawl on ‘In the Aeroplane Over The Sea’ by a fair few years. This album is basically a master-class for any songwriter struggling to write a single without compromising their sound." Mascis himself would go on to rank it as his 3rd best effort, saying: "We were trying really hard and it was well realized for what we wanted to do." The Felled Trees Collective, consisting of members from Thrice, Samiam and No Motiv (also featuring appearances from Texas Is the Reason, Knapsack, Beat Union and numerous other bands), covered the album in its entirety on its 20th anniversary. The album was released on the 15th of October 2013 through the Siren Records webstore. All songs written by J Mascis. Mike Johnson – bass, guitar, piano, backing vocals, 1st guitar solo on "Get Me"
Tiffany Anders – vocals on "Get Me"
^ "Dinosaur Jr - Where You Been". Punknews.com. Retrieved 26 December 2018. ^ Raggett, Ned. "Where You Been – Dinosaur Jr". AllMusic. Retrieved August 31, 2011. ^ Kot, Greg (February 18, 1993). "Dinosaur Jr.: Where You Been (Sire)". Chicago Tribune. Retrieved May 1, 2017. ^ "Dinosaur Jr.: Where You Been". Entertainment Weekly: 59. March 5, 1993. ^ Hilburn, Robert (February 7, 1993). "Dinosaur Jr. Stands Tall in Land of the Giants". Los Angeles Times. Retrieved May 1, 2017. ^ "Dinosaur Jr.: Where You Been". Mojo (153): 110. August 2006. ^ Moon, Tom (February 14, 1993). 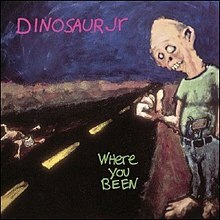 "Dinosaur Jr.: Where You Been (Sire/Warner Bros.)". The Philadelphia Inquirer. ^ Harvell, Jess (May 19, 2006). "Dinosaur Jr.: Green Mind / Where You Been / J Mascis Live at CBGB's The First Acoustic Show". Pitchfork. Archived from the original on March 22, 2007. Retrieved August 31, 2011. ^ "Dinosaur Jr.: Where You Been". Q (77): 79. February 1993. ^ Azerrad, Michael (February 18, 1993). "Where You Been". Rolling Stone. Retrieved August 31, 2011. ^ Collis, Andrew (March 1993). "Dinosaur Jr.: Where You Been". Select (33): 71. ^ "Where You Been - Dinosaur Jr. | Songs, Reviews, Credits". AllMusic. Retrieved 2019-02-28. ^ Azerrad, Michael; Azerrad, Michael (1993-02-18). "Where You Been". Rolling Stone. Retrieved 2019-02-28. ^ Kot, Greg. "Dinosaur Jr.Where You Been (Sire) (STAR)(STAR)(STAR) 1/2"Where..." chicagotribune.com. Retrieved 2019-02-28. ^ "Robert Christgau: CG: dinosaur jr". www.robertchristgau.com. Retrieved 2019-02-28. ^ Fiander, Matthew. "Quarantining The Past: Dinosaur Jr.'s 'Where You Been'". Prefixmag.com. Retrieved 2019-02-28. ^ Chick, Stevie. "BBC - Music - Review of Dinosaur Jr. - Where You Been". www.bbc.co.uk. Retrieved 2019-02-28. ^ Murray, Noel. "60 minutes of Dinosaur Jr.'s stormy guitar epics". Music. Retrieved 2019-02-28. ^ "Dinosaur Jr. Green Mind / Where You Been". exclaim.ca. Retrieved 2019-02-28. ^ "Where To Start... Dinosaur Jr". Clash Magazine. Retrieved 2019-02-28. ^ Garland, Emma (2016-08-18). "Rank Your Records: J Mascis Rates Dinosaur Jr. Albums from Bummer to Classic". Noisey. Retrieved 2019-02-28. ^ Sciarretto, Amy. "Felled Trees Collective Cover Dinosaur Jr's 'Where You Been' Album". Noisecreep. Retrieved 2019-02-28. ^ "Acclaimed Music". www.acclaimedmusic.net. Retrieved 2019-02-28. ^ "Robert Christgau: Pazz & Jop 1993: Critical Poll". www.robertchristgau.com. Retrieved 2019-02-28. ^ "Rocklist.net...Melody Maker End of year Lists - The '90's ..." www.rocklistmusic.co.uk. Retrieved 2019-02-28. ^ "Rocklist.net...Select End Of Year Lists." www.rocklistmusic.co.uk. Retrieved 2019-02-28. ^ "Vox Magazine End Of Year Lists... 1990 - 1997". www.rocklistmusic.co.uk. Retrieved 2019-02-28. ^ "1,000 Recordings to Hear Before You Die". Workman Publishing. Retrieved 2019-02-28. ^ "DinosaurJr-WhereYouBeen-1 Stereogum". Retrieved 2019-02-28. ^ "Rocklist.net...Select Best of the '90's." www.rocklistmusic.co.uk. Retrieved 2019-02-28.